Pamper your great love with this amazing bouquet. 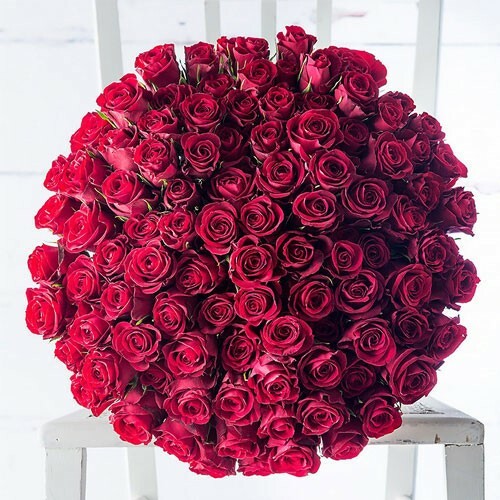 100 red roses convey your feelings in a way expressions never could. Sending flowers to your significant others and business associates is very easy and convenient with FlowersDubai.co.uk. Not only will you get a stunning, professional floral arrangement or bouquet - you will similarly get an excellent customer service and hand-delivered flowers and gifts! At FlowersDubai.co.uk, we have been providing high quality services that bring smiles to people’s faces for the last 8 years. We take pride in delivering great quality flowers and prompt, reliable flower delivery options to our customer. If you are looking for same-day flower delivery anywhere in the UAE? Call us or place your order online, this is one of our specialties! Flowers are the perfect gift for any occasion. With FlowersDubai.co.uk, you can look for your floral arrangements by occasion, including birthday bouquets, Mother's Day flowers, and Valentine's Day flowers and much much more. With FlowersDubai.co.uk, showing how much you care about the recipient is extremely easy. With a large offer of flowers, plants, floral arrangements, hampers and yummy baskets – you can be confident to find the ideal gift for all your significant others and business associates. Don’t let distances stand between you and your special friends use FlowersDubai.co.uk to send flowers everywhere in the United Arab Emirates. Make FlowersDubai.co.uk your preferred provider for flower delivery in the UAE. Our florists will assist to design your gifts at a local flower shop using the best and freshest cut flowers. At FlowersDubai.co.uk, we guarantee you get the best flowers as per our FlyingRoses.com network requirements. Ready to order online? Our ordering system makes it appropriate and relaxing to order and send flowers to someone in Dubai, Sharjah, Abu Dhabi or all other Emirates of the UAE. Send flowers today!